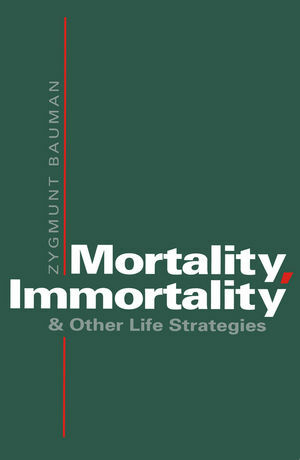 Zygmunt Bauman's new book is a brilliant exploration, from a sociological point of view, of the 'taboo' subject in modern societies: death and dying. The book develops a new theory of the ways in which human mortality is reacted to, and dealt with, in social institutions and culture. The hypothesis explored in the book is that the necessity of human beings to live with the constant awareness of death accounts for crucial aspects of the social organization of all known societies. Two different 'life strategies' are distinguished in respect of reactions to mortality. One, 'the modern strategy', deconstructs mortality by translating the insoluble issue of death into many specific problems of health and disease which are 'soluble in principle'. The 'post-modern strategy' is one of deconstructing immortality: life is transformed into a constant rehearsal of 'reversible death', a substitution of 'temporary disappearance' for the irrevocable termination of life. This profound and provocative book will appeal to a wide audience. It will also be of particular interest to students and professionals in the areas of sociology, anthropology, theology and philosophy. Zygmunt Bauman (1925-2017) was Professor Emeritus of Sociology at the Universities of Leeds and Warsaw. He is the author of a number of other books including the extremely successful Modernity and the Holocaust (Polity, 1989) which won the 1989 European Amalfi Prize for Sociology and Social Theory, and Modernity and Ambivalence (Polity, 1991). He was also awarded the Theodor W. Adorno prize for 1998. 4. Modernity, or Deconstructing Mortality. 5. Postmodernity, or Deconstructing Immortality. Postscript: "To Die For..." or Death and Morality. * Zygmunt Bauman is one of the world's leading social theorists. * This is a profound and provocative book which will have wide general appeal. * Bauman's previous books have all been well received.